So, to kick it off Chris loves all banana related desserts, and he loves anything remotely crunchy. One of the best banana related desserts (I think) he's ever had is this (see Peanut Butter "Bavarois") ... The main elements that made this so delightful that I'd love, if possible, to translate somehow into his birthday cake were the banana-y, peanut butter-y flavors of the mousse (because this guy seriously loves anything banana), and the light toffee / chocolate crunch from the little round ball on top (which was filled with banana, NOM) and the feuilletine. When I googled "Peanut Butter Bavarois", an artfully constructed dessert popped up made by none other than French Laundry, a restaurant with three Michelin stars! Of course I started to panic a little bit under the pressure of trying to live up to an extremely high expectation. Rather than focusing on the French Laundry dessert, I decided to work with the different elements - crunchy, banana, mousse, peanut butter and chocolate. So I came up with this chocolate peanut butter mousse cake. It actually turned out to be quite a complex cake with multiple layers. I wanted to create a nice crunch on the very bottom so I baked up an short bread cookie crust just like some of the cheesecake recipes call for. Over this crust, I poured some rich dark chocolate ganache to lay a thin layer of dark chocolate chiffon cake over it. Next was the peanut butter mousse which was made from silky pastry cream, then went on a layer of thinly sliced bananas. Some more mousse was added on top with little chocolate crunch balls to add some more interesting textural contrast. The layers were repeated once more and topped with a final cake layer and some whipped up chocolate ganache to give the final smooth finish. I decorated the cake with these beautiful chocolate dipped wafer cookies I found together with some chocolate covered malt balls. The cake indeed was banana-y, crunchy, chocolate-y, peanut-butter-y, and delightful! This may be my favorite creation so far in terms of being on par with what I had imagined in my head. Everybody enjoyed the cake and had a good time at the special birthday brunch at Foreign Cinema even though our waiter was absolutely horrible and tried to rob us of the rest of the delicious cake! For a couple of months, my friend Deepti had been reminding me time to time that she wanted a Family Guy cake for her October birthday. Luckily, my work trip to Asia that was supposed to coincide with her birthday got canceled so I was able to keep my promise to her that I would make her a Stewie (her favorite charater) cake. Here is a three layer red velvet cake with rich vanilla infused cream cheese frosting and Stewie made out of sugar cookies. Sometimes what's simple is the most delicious. The birthday dinner was wonderful and the birthday girl was delighted when the cake appeared in front of her! By the way, while looking up images of Stewie for the cake, I noticed that it is extremely difficult to find a non-evil, genuinely happy facial expression of him. The search result page was filled with sneering, plotting, angry, shouting Stewies. I love Stewie. On a perfect summer day a month and half ago, my roommate Erin's older sister Tracy had her beautiful wedding at their parents' house up on a hill in Saratoga. The wedding ceremony was held at their backyard which was completely re-landscaped and transformed into a stunning wedding venue with a hilltop view and freshly laid grass. And then it was followed by brief refreshments and picture taking sessions and a reception at a country club afterwards. My job was to make little baked refreshments to go with pearl milk tea (what a brilliant idea!) that was being served at the ceremony site. I did not want just one kind of baked goodie, but a variety - maybe something for chocolate lovers, something Asian to go with PMT and something else that was fruity. Green tea sandwich cookies with white chocolate ganache filling - these were made with real Japanese Matcha powder to give that fragrant green tea flavor and the vibrant green color. They were sprinkled with a little bit of turbinado sugar for an additional crunch. The sweet white chocolate provided a good contrast to the tiny bitterness of the green tea. Chocolate sandwich cookies with dark chocolate ganache filling - these little cookies were chocolate all the way. The cookie dough was made with dark cocoa powder, piped into little horse shoe shapes, baked till crisp and filled with rich dark chocolate ganache. Tangy lemon bars - The creamy filling was sweet and tangy from the fresh lemon juice and provided a nice textural contrast from the crispy nutty crust on the bottom. These bars were made in a large sheet pan then cut into sizes. They were adorned with powdered sugar and little tiny edible gold stars. The wedding was perfect. It was not too big, very intimate, and simple yet elegant. I'm glad I got to be a part of it and I was very happy to see everyone enjoying the treats. Special thanks to my trusty assistant and my roommate Petunia. Recently my boyfriend Eric's little nephew turned one! He's developed a very sophisticated palate over the year. He loves hummus - all kinds including spicy and roasted garlic ones - avocados and he absolutely adores bananas. He often devours one as an appetizer before he drinks his bottle of milk. So for his first birthday party at a park, I decided to make banana cupcakes, but I didn't want plain ole banana cake. I wanted to jazz it up with some special filling and decorations on top. The cake which had spongier and lighter texture than butter-based cake was banana chiffon cake with a generous amount of mashed bananas incorporated into it. The cupcake was then filled with creamy, rich dark chocolate pastry cream and then frosted with a light cream cheese frosting infused with vanilla beans. To make the cupcakes more fun and to add more interesting textures, I coated the sides with crushed oreo crumbs and then topped them with little colorful star shaped candies and crunchy chocolate pearls. After singing him his very first Happy Birthday, he dove right into the cupcake that was as large as his head trying to take a bite with his tiny little itsy bitsy mouth. So adorable! Continuing with the birthday extravaganza, for Rick's birthday celebration at Grill'Em (a grill your own steak place), I wanted a cake that's not too rich after a gigantuous steak feast. And Rick usually does not like anything "weird" in desserts meaning no dried fruits, no ginger, or no strong spices. Generally things with chocolate win him over. So I decided to make Boston Cream Pie which is actually not a pie but a cake filled with custard and frosted with chocolate. It was a two layer of sponge cake with creamy vanilla custard filling in between. I dabbed the cake layers with a bit of Kalhua to infuse some more flavor and also to add to the birthday festivity. The cake was finished off with a layer of rich dark chocolate ganache on top. Overall the cake was perfectly light but with that little bit of chocolate richness at the end. I ended up with some extra of all the cake components so I made a mini Boston Cream Pie! My two roommates Erin and Petunia's birthdays are only two weeks apart. That means lots of planning and baking for me around that time of the year. For Erin, I decided to make cupcakes since we were planning to surprise Erin with a bunch of friends at a lounge in downtown PA -- no utensils required. Going along with our love of asian food, I made almond cupcake with green tea frosting and red bean filling. Red bean and green tea are classic asian combos. The cupcake itself was a soft sponge cake with a bit of almond to add a nutty kick and unique texture. It was then topped with green tea frosting made with melted white chocolate and filled with red bean cream. A generous amount of sweet red bean was crushed and mixed into pastry cream for this filling. And then I got an idea of kicking it up a notch to make them extra special for Erin -- decorating them with custom fortune cookies. With the help of our friends, I found some very interesting fun facts about Erin, printed them out on strips of paper and inserted them into the homemade fortune cookies. Making fortune cookies turned out to be a lot more labor intensive than I had anticipated. I could only make 3 per batch because I had to immediately form them into the right shape as soon as the batch came out of the oven or else they would cool down and crisp up before they could be shaped. Here are some new things I found out about my roommate and friend of over 6 years (some of them I already knew...). Erin once broke a window with her head. She won a trophy for Kumon during high school. One time when she was a kid, she laughed so hard that milk came out of both nostrils! Now moving onto Petunia's birthday. For the past two years, I've created cocktail inspired cakes for her. Two years ago, I made a mojito cake and last year was pina colada cupcakes. While brainstorming with Erin about new creative cake ideas, I suddenly remembered Penny's baking lemon bars twice in a two week time period a couple of months ago. She loves lemons! What's a cocktail that has lemon? LEMON DROP. You only need three ingredients to concoct this tangy sweet cocktail - vodka, lemon and sugar - making it quite simple to capture its flavor in a cake. I made a lemon mousse cake with buttery, crumbly vanilla shortbread cookie crust. The lemon mousse was made with sweet lemon curd and freshly whipped cream to lighten it up with a touch of vodka. Then the cake was topped with a thin layer of vodka lemon jelly to give it that vodka kick and a pretty shiny finish on top. The light mousse cake with a refreshing lemony tanginess was perfect for the hot heat wave stricken day in south bay. I am bummed my favorite fruit season - stone fruit season is over! I have been everywhere the past few weeks with birthdays and travels so my posts are very very overdue. Time to catch up! Tim is a fellow classmate of mine from college and I was absolutely delighted by the opportunity to make a wedding cake for him and his beautiful finance Cyndy. Because Tim is living in Philadelphia, the cake planning had to be done long distance via emails. It ended up not being difficult as Tim and Cyndy were extremely cooperative and trusted me a great deal that I would deliver a quality cake. Because it was long distance, we did not even have a chance to do a cake tasting like I have done with other wedding cakes, but they decided to go ahead with the cake anyways. I sincerely thank them for trusting me so much. After going back and forth on the ideas for the different flavors, we decided on chocolate raspberry cake and as Cyndy loves chocolate ganache (as do I! ), I incorporated it into the cake. This cake had chocolate cake as its base and had raspberry buttercream with fresh raspberries and rich dark chocolate ganache filling alternating between the four layers of cake. Then finally, the cake was frosted with velvety vanilla buttercream frosting for the classic white wedding cake finish. I found decorating cakes with fresh flowers to be my favorite. To me, it's the most beautiful, the simplest, yet elegant while completely matching the rest of the reception site decor. And so Tim and Cyndy's cake was done this way as well. While setting the cake up, I had a chance to look around the reception site. It was absolutely beautiful, decorated with flowers of my favorite color -- purple. And each table was labeled with restaurant names that are special to the couple where they shared memories together. It was simply perfect. Massively overdue post -- I've been kept so busy with little things here and there! Erin's wedding was absolutely beautiful. The deep magenta and green color combinations of her flowers could not have been more perfect for the outdoor reception on such a beautiful summer day. 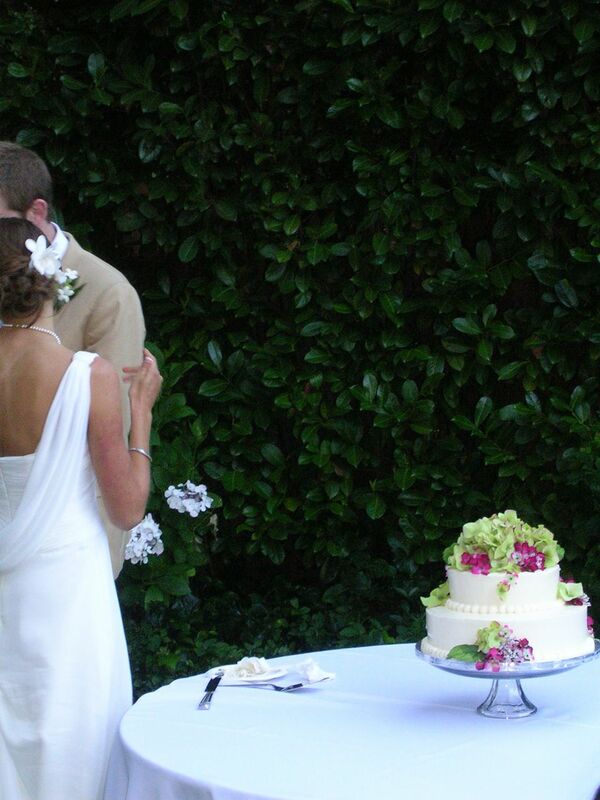 The two tier wedding cake was a simple yellow cake with tart and sweet lemon curd and fresh blackberry filling. I absolutely love this photo taken by my freshman roommate. Kudos to you, Kelly! Zeena whom I made the message-in-a-bottle cake for previously sought me out for her son's upcoming birthday. 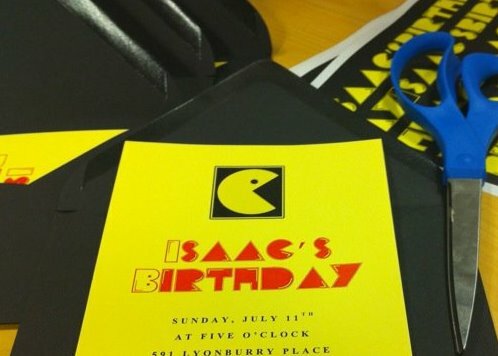 Her son Isaac was celebrating his special day with a Pac-Man themed party, his favorite game. I love Pac-Man. It brings back so many of my fondest memories, one of which is my college graduation. My friends and I actually cut out giant Pac-Man, and Miss Pac-Man, ghosts and cherries out of colored cardboard and ran around the stadium holding them during our traditional graduate processional into our stadium called the Wacky Walk. Fun times! Here's a little fun Google Doodle version if you want to play quick game! Zeena wanted the cake flavor to be the same as the one I made for her before -- vanilla chiffon cake with strawberry puree and generous amounts of fresh strawberry slices and light vanilla mousse between the cake layers. For her previous cake, I had used a whilte chocolate frosting for the outside for the white satiny finish but for this cake, I decided to cover it with dark chocolate frosting to get that nice dark background to recreate the Pac-Man game screen on. The cake was decorated to match the lovely inviation Zeena had created for the party. I made little ghosts and pacman cookies and used yellow mini M&Ms for the dots that the Pac-Man consumes. In addition to the cake, Zeena requested for some matching cookies to go along with. I found this perfect little tulip cookie cutter that I could use to make Pac-Man ghosts when flipped upside down. The cookie base was simple sugar cookie dough rolled out and baked till crisp and then covered with colored icing. The eyes were created with white chocolate and milk chocolate chips. The ghosts were absolutely adorable when they were put in a giant cluster butted up against each other! It was great to hear that the party was a success and that the cookies added a nice decorative touch to it. Thank you so much Zeena for your kind words! 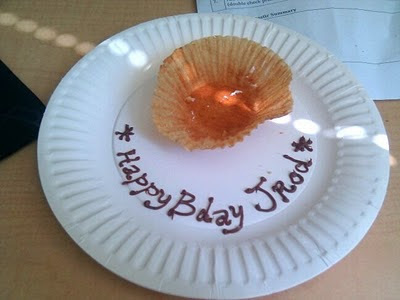 My coworker Jrod has been a huge help for my cake business. Being in charge of some of the Google cars, he has kindly let me use one of the SUVs to transport my larger cake orders to the different venues. I would always promise him he will someday be rewarded with something delicious in return but never got the chance to... until his birthday! Another coworker of mine, Brenda's lemon tree has been producing a lot of lemons so she would bring in a bag full of beautiful organic (but unusually large) lemons freshly picked from her yard to our meetings time to time. Just in time for Jrod's birthday, Brenda had brought in a bag full of lemons that same week so I made some lemon curd from the freshly squeezed lemon juice from the lemons freshly picked from Brenda's tree - how much better can it get? Lemon curd is one of my favorite things. It's tart, sweet, creamy, everything. I made a small batch of vanilla cupcakes with some lemon zest to add some texture and fragrant bite to the cake. I scooped out the cupcake from the middle and filled it with as much lemon curd as I can, then topped it with fluffy vanilla buttercream infused with a touch of coconut extract. And finally, it got a generous sprinkling of coconut flakes on top. I left the cupcake on his desk before he got to work on his birthday and he then later on posted this picture on facebook with a caption that made me very happy. "Thank you, Ji. I ate the cupcake before I can even pull out the camera; it was delicious." Thanks Jrod for your help! Erin Bell was referred to me by my dear friend and freshman roommate from college Kelly Schmutte. Kelly is one of the most talented and kindest people I know (I miss you!) so I was very strongly compelled to work with Erin for her wedding coming up in July even though I had never met her before. I am going to take advantage of this moment to show off how amazingly talented Kelly is. As a ballerina and a designer, she developed a brilliant product idea that she worked on during her course at Stanford and turned it into a company! Check out: http://www.perfectfitpointe.com/. Anyhow, unlike the grand four tier cake I created for Lisa and Sihoong, Erin requested for a smaller cake and little cookies to accompany it. I was relieved to hear this because I wasn't sure if I was ready to take on such a large project yet. Of the several choices I provided, Erin selected two cakes to taste: blackberry lemon cake and strawberry meringue cake. I also wanted to give her a few choices for the cookies and knowing that some people are not fans of chocolate (what?! 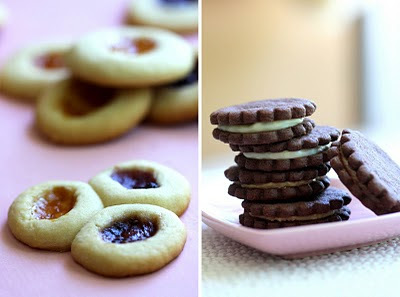 ), I decided to make jam-filled cookies as well as chocolate sanwich cookies with several different choices of fillings. The blackberry lemon cake was a four layer of vanilla yellow cake with a touch of fresh lemon zest. The cake is butter based so it holds up nicely when stacked yet has fine moist crumbs with a very light texture. The first layer of the cake was brushed generously with lemony simple syrup and spred with some homemade fresh blackberry filling. The blackberry filling was simply fresh blackberries cooked down with sugar until the berries break down and thicken into a jam-like consistency but much fresher than a store-bought jam. The second layer of the cake moistened with more syrup was stacked on top and topped with lemon curd made with freshly squeezed lemon juice and perfumey lemon zest. The combination of blackberry and lemon was so good that I kept sneaking in spoonfuls of lemon curd with the filling while assembling the cake! The third layer was topped with some more blackberry filling and the final layer of the cake. The assembled cake was coverd with light meringue buttercream infused with vanilla. The second cake was similar to the first one with the vanilla yellow cake as its base, but rather than blackberry and lemon curd filling, it was filled with fresh strawberries and a crispy meringue disc with some more buttercream between the cake layers. The cake was finished off with more vanilla buttercream. Now for the cookies, I made a trio of jam filled cookies - apricot, raspberry and blueberry filled cookies mashed together to form one little jewel-like piece. I wanted to differentiate my cookies from the jam-filled cookies commonly sold in the markets. The trio cookies did not only look fun and pretty but also created a burst of sweet fruity flavors in the mouth when bit into it. For the chocolate lovers, I baked thin crispy chocolate cookies that had the deep rich chocolate flavor densely packed into them. The sandwich cookies were filled with several different fillings of white chocolate ganache, peanut butter frosting, and dulce de leche. Each one was delicious in its own way, but after tasting them, the bride and the groom-to-be picked out the white chocolate ganache as the winner. As for the cakes, they went back and forth between the two choices. The fresh fruit fillings and the light texture made both of them the perfect choices for a wedding on a hot summery day. After much deliberation, they decided on the blackberry lemon cake. 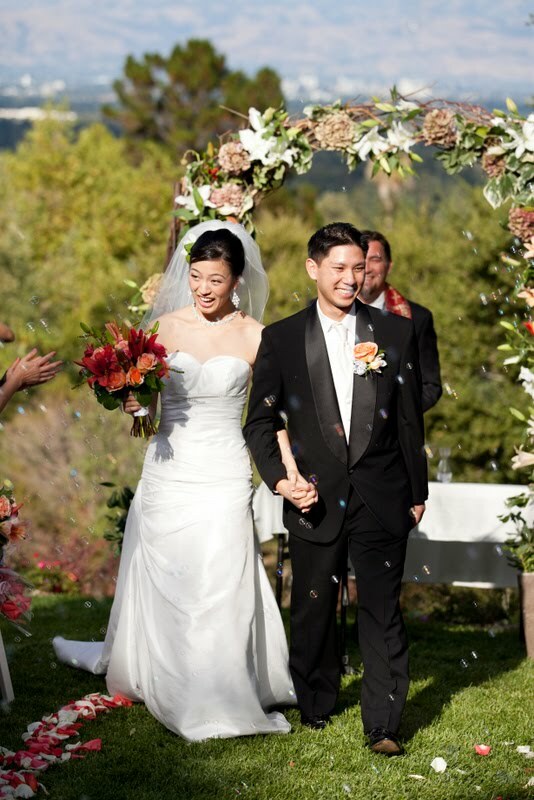 I am very excited about their choice since I get to make something different from Lisa and Sihong's wedding cake! I am looking forward to their wedding day which is actually creeping up really fast now that I think about it. Time to get rolling on churning some buttercream out! Captured at Lisa and Sihong's wedding reception! I've maybe only watched parts of 1 or 2 episodes of Family Guy ever in my life. I remember enjoying the crude jokes made by Peter, being creeped out by Stewie's deep voice and Brian's human-like behavior. I'm not sure why I never started watching more episodes. Maybe it's time to start. When Linda asked me to make a Family Guy themed cake, I didn't experience any panic moments like when I did with the South Park cake. I felt confident that I could pull this off even though the characters of Family Guy are much more complex in terms of their looks than the South Park characters who look essentially like circles with giant round eyes. I kept the decoration similar to the South Park cake - using sugar cookies as the main decoration pieces. The cookies are simple sugar cookies with their outlines piped with melted dark chocolate and the borders filled with colored icing. Linda requested the strawberry meringue cake similar to the wedding cake I made for Lisa so I created a three layered cake with a vanilla yellow cake as the base. The first layer of the cake was covered with creamy, fluffy vanilla buttercream and fresh strawberries after it was moistened with light syrup infused with vanilla beans. Between the second and the third layers of the cake was meringue disc that was baked til crisp to add a crunch texture. The contrast in textures, and subtle vanilla flavors combined with the freshness of the strawberries is what makes this cake a perfect choice for the summer. Lastly, the cake was finished with more vanilla buttercream for the beautiful satiny finish. I had a lot of fun with this cake. I'd say Stewie cookie was my favorite to decorate because of his very distinct football head shape and he didn't really need any icing other than the teeny bit for his eyes. I really hope Linda's son David enjoyed the cake on his very special day! After many weeks, I finally managed to retrieve the memory card from the camera that I took these cake photos with! So this post is extremely long overdue. It was my boyfriend Eric's birthday a month ago so I organized a dinner at a restaurant in SF with a few of his close friends. Because they all know that I bake cakes, I couldn't let them down by showing up empty-handed. So I decided to make a special cake by Ji and bring it to the restaurant to share with everybody. I wanted something light, fresh, and summery. While browsing through the different recipes, I suddenly thought of the raspberry almond cake that I made for my friend Van's completion of her CA exam. It was the perfect cake for the occasion with lots of fresh berries and light texture after feasting on a delicious birthday meal. The basic composition of the cake was the same as before but I made a few changes. I switched the vanilla cake to my beloved chiffon cake with a hint of almond. Then the cake layer was spread with raspberry preserve to add some more intense berry flavor. In between the three cake layers was fresh blueberries, raspberries and blackberries and sweet vanilla custard that was infused with ground almond and lightened by folding in whipped cream at the end. The almond flavor was subtle yet it provided a perfect complement to the fresh berries and the delicate crumbs of the chiffon cake. The cake was finished off with cream cheese frosting sweetened with melted white chocolate that provided the perfect amount of sweetness. And finally, it was adorned with toasted almond slices and some more fresh berries on top that I bought from the farmer's market that same morning. The cake was a big hit! I was so touched when Fay commented that it was the best cake she ever had and when I saw Jacob finish his generously sized slice claiming that he is not a dessert person. And of course, the birthday boy enjoyed the cake too - he devoured the last piece we saved the very next day! I wanted to post some pictures I took during the dinner but unfortunately, I've misplaced my small camera that I took photos with. Hopefully it will show up somewhere soon! For my dear friend Heesun's birthday, her sweet roomie had organized a surprise day trip to Sonoma Valley for a fun filled day of wine tasting, delicious food, and good company. The seven of us rented a limousine and started the day off with a bottle of champagne on the way to our brunch at The Girl & the Fig in downtown Sonoma. If you haven't been here, be sure to stop by the next time you make your way up to Sonoma! The deelish brunch was followed by a couple of wine tasting sessions at wineries. For this very special day, I decided to make a little birthday treat for the limo ride. I remembered that Heesun's favorite cake is carrot cake. A couple of years ago, her best friend Janice wanted to make a cake for her birthday and came over to get help in baking a carrot cake, Heesun's favorite. So I made mini carrot cake with cinnamon cream cheese frosting. I've tried a bunch of different carrot cake recipes before and I think I finally found THE ONE. It is the recipe from Rose's Heavenly Cakes. Her cake is moist and light and has the perfect amount of spice. Also, I grated the carrots a lot coarser than usual per instructions in the recipe. This really helped the subtle carrot flavor to come through and gave the cake a great texture. For the frosting, I used Rose's Dreamy Creamy White Chocolate Frosting with a pinch of cinnamon for taste. I am an avid advocate of cream cheese frosting but most recipes call for an obscene amount of powdered sugar. This frosting does not use any powdered sugar but instead uses creamy melted white chocolate to to sweeten the whipped up cream cheese. The white chocolate flavor adds an extra dimension to this creamy frosting and gives it the perfect silky texture. The mini cupcakes were decorated with green tinted white chocolate decoration and an orange colored mini M&M. The weather was beautiful, the wine was excellent, everyone had a blast and the birthday girl was happy and bubbly from the wine. It was just a perfect day! A few weekends ago was my roommate and my friend Carlos' birthday. Carlos' wife, Aiste who ordered a cake from me last year for her cutest little baby boy's first birthday, ordered a cake for Carlos's suprise birthday party she was planning. I remember I was so grateful last year to hear them rave about the cake afterwards especially because I spent many sweat breaking hours making the large rectangular cake with multiple layers. Now, that all feels like a long long time ago. I still can't believe I made a multi-tiered wedding cake since then! Aiste wanted the same cake as last time but I wanted to put a little twist to include beautiful strawberries in season rather than raspberries and changing up the frosting a bit to add to the dark chocolatey goodness. Last time, I used a more dense butter based cake recipe but my formerly mentioned new found love for chiffon cakes continues to shine on this creation. The first layer of the dark chocolate chiffon cake was spred with whipped up dark chocolate ganache. I discovered this whipped up version of the commonly found ganache in the Rose's Heavenly Cakes and found it to be light and fluffy in texture while retaining the same richness. I think this is going to become my go-to chocolate frosting for cupcakes from now on. The layer of ganache was then generously sprinkled with homemade hazelnut brittle to add some crunchy texture and nutty kick to the chocolate. The second layer of the cake was then brushed with raspberry and strawberry puree and then topped with strawberry mousse and bits of fresh strawberries. Finally, the cake was covered with more of the whipped dark chocolate ganache and then decorated with dark chocolate covered malt balls and fresh strawberries. Aiste, thanks for seeking me out again and Carlos, I hope you are enjoying your new job! Okay, now moving onto my roommate's birthday cake. So as I've mentioned before, it has become a tradition amongst my friends and I to present each other with homemade cakes on birthdays. Last year for my roommate Sandy's birthday, Erin and I thought hard about what kind of a cake to make and decided that it would be fitting to make her an asian inspired one -- a taro cake. So we bought fresh taro, made a mousse using homemade custard cream and whipped cream. The cake turned out a gorgeous purple hue and had a very good flavor but the problem was the gooey, slimey taro texture. Even though Sandy seemed to have enjoyed the cake a lot, I consider this cake a bit of a failure because of the odd texture. So this year was a chance for redemption. I wanted to stick to the similar asian theme but this time, replacing the taro with sweet potatoes! A sweet potato cake may sound strange, but it's actually very popular in korea and I happen to love anything and everything sweet potato. So this cake choice makes a ton of sense to me. I wanted to make something light and unique for Sandy. The cake itself was a simple classic genoise lightly brushed with a bit of a hazelnut syrup to add an extra layer of flavor and moistness. In between the four layers of cake was a generous amount of sweet potato mousse made with mashed sweet potato, honey, custard cream infused with vanilla beans and then lightened with whipped cream. I absolutely fell in love with this mousse and I may have slipped in a spoonful(s) of it here and there while making it. It was light, and perfectly sweet with that touch of honey. Finally, the cake was covered with lightly sweetened whipped cream and adorned with fine cake crumb and chocolate covered malt balls. I accidentally overwhipped the cream for the decoration portion so the piping job was not so great but overall, the cake turned out nice and simple. The birthday festivity spanned throughout the day beginning with: a surprise picnic at the Shoreline park, a picnic lunch with homemade noodle salad, wraps, sandwiches and snacks, a heated game of croquet on the grass (my first time! ), followed by a surprise sushi making lesson at Fuki Sushi where we learned how to make three different types of sushi (the names are slipping my mind at the moment) and then finally the cake celebration back at our house. What an eventful day! Oh and did I mention we love to take jumping photos?